WHAT ARE THE HISTORIC ROOTS OF BRITAIN’S CONTINUING ANGST ABOUT EUROPE? Why has Britain always had such an ambiguous approach to being involved in the EU? Why did it refuse to join the Common Market in 1957, only to apply to join in 1961? Why has it felt the need to opt out of many EU policies, and why is making a modest contribution to the EU budget so controversial in Britain? 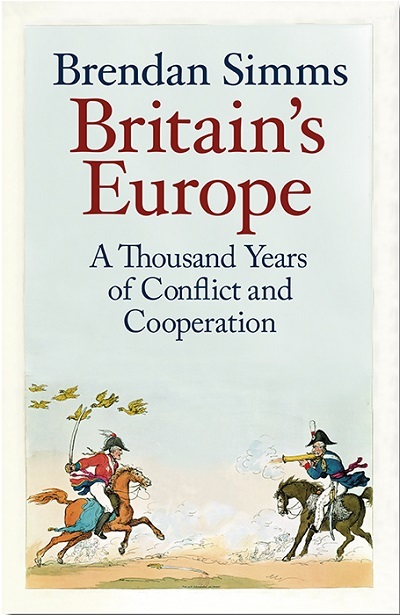 “Britain’s Europe, A thousand years of Conflict and Cooperation” by Brendan Simms, an Irish historian, who is Professor if the history of International Relations in Cambridge University in the UK. 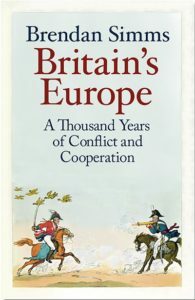 In this excellent book, he explores the deep historic roots of Britain’s attitudes to the continent of Europe. His underlying thesis is that England’s abiding concern has been to protect itself from unwanted intrusion by continental European powers. Even Britain’s imperial expansion into other continents, and its development of the dominant navy in the world, were designed, Simms believes, to bolster its position vis a vis Europe. England interfered in Ireland and Scotland, and invaded them, to prevent them being used as a base by its continental enemies. These motives, Simms argues, lay behind the Acts of Union of 1707 with Scotland, and of 1800 with Ireland. England made alliances with lesser powers on the continent to curb whichever was the continent’s biggest power. First it did so to curb Spain, later to curb France, and most recently to curb Germany. Its policy was to create a balance of power on the continent so that no one continental power would be strong enough to threaten Britain. It always felt vulnerable to invasion from the continent, and indeed it was only thanks to luck, or to unfavourable winds, that many planned invasions did not happen. The last successful invasion was by the Dutch in 1688. To deter invasion, England always wanted to ensure that the dominant continental power did not control the “Low countries”, now Belgium or Holland. Britain went to war against France in 1792, and against Germany in 1914, to prevent the dominant European power controlling the Low countries. British statesmen have not been opposed to European unity on principle. After the defeat of Napoleon in 1814, Castlereagh favoured regular European Summits. The problem for England is that a united Europe would make the British policy or backing lesser powers to create a balance of power impossible to operate, unless, of course, Britain could do this from INSIDE a united Europe. But that would trammel its historic freedom of action. Its continuing inability to decide on which of these contradictory options to pursue explains why “Europe” is such a toxic issue in British politics. the size of its conventional military. He believes that the Euro Zone will have to create a fully fledged Federal state to sustain the Euro. He believes the UK would stay out of this. While I agree with this last point, I find both of his other arguments unconvincing. Britain is not that different, and the euro can be sustained without a fully fledged Federal state being created. I attempted to show how, in a previous posting on this site. This is a very timely book and deserves to be read in all European countries, including Ireland. The balance of power thinking that motivates British policy was relevant when Europe had 25% of the world’s population and 50% of its wealth. It makes much less sense now, when Europeans are only 7% of the world’s population and have a declining share of global wealth. Nostalgia is nor a sound policy, for Britain or for Europe as a whole. That is why UK voters should remain in the EU.